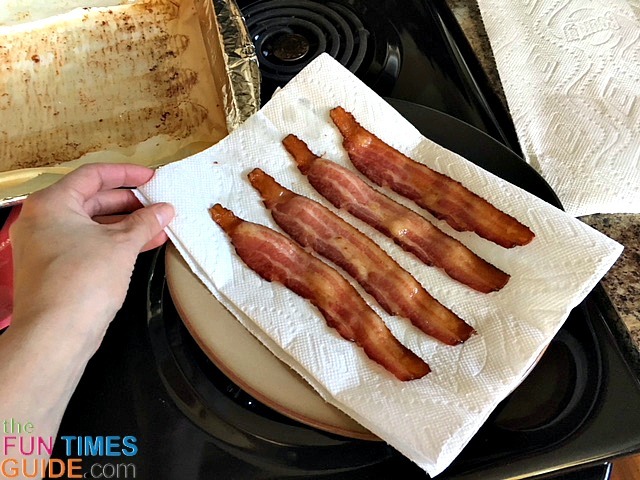 Baking Bacon Splatter-Free: How To Cook Bacon In The Oven Without The Mess! I just finished cleaning my oven. What a pain! I knew the culprit of this recurring mess (cooking bacon in the oven) — yet here I was again, cleaning and cursing. We love bacon. I generally bake it in the oven on a rimmed baking sheet lined with tin foil, letting the bacon grease fly. For the sheer convenience of it, I’ve been cooking bacon in the oven — knowing full well that it splatters grease everywhere inside of it. 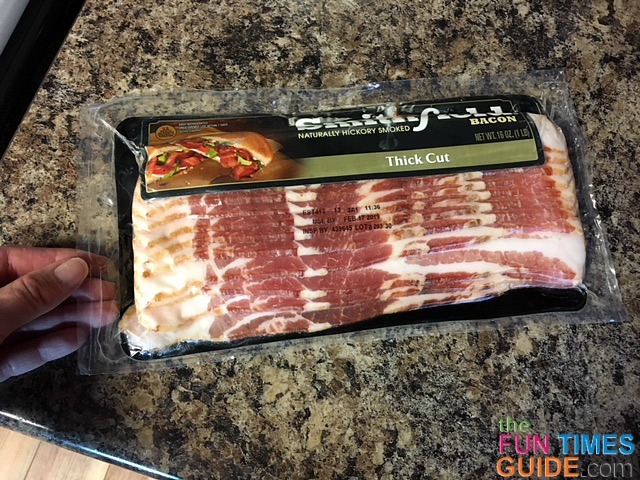 But after this round of cleaning my oven, I decided it was time to try solve the “How to bake bacon perfectly without the grease splatter mess” mystery… and I’ve finally found the answer! I’ve scoured the Internet for other people’s methods of cooking bacon in the oven mess-free. Although some of the ideas sound great in theory, they fail to address the cleaning of the wire rack that the bacon is baked on. Not to mention the obvious fact that the bacon is still not covered — so it splatters grease everywhere inside the oven. It seems so silly that I have gone this far in life only to discover this no- mess method recently when I had a light bulb go off in my head. Low and behold… it worked. And I never had my bacon turn out so even and perfectly cooked! The bake time and temperature to bake bacon listed below are obviously based on my own oven. 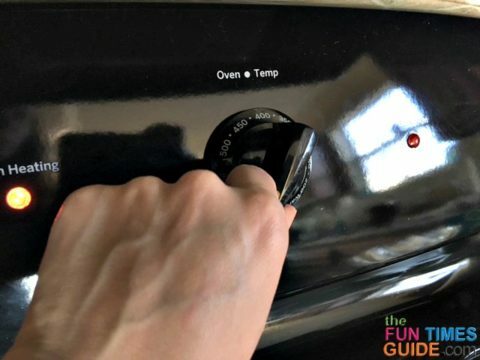 Since no 2 ovens are alike, I would suggest experimenting with the bake time by checking on the bacon the first time you attempt this method — just in case your oven runs hotter than mine. Plus, each variety of bacon will cook slightly different. I would start by checking on it at the 10-minute mark. 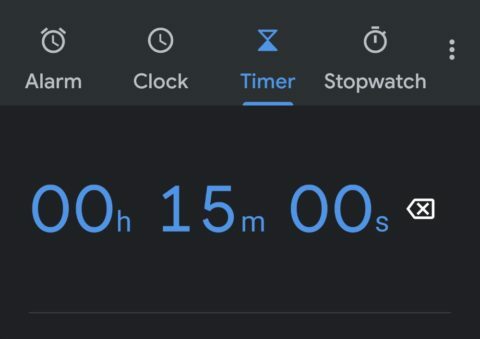 Then gauge and record the time from there — to make a judgement call based on your desired crispness. We like our bacon slightly crispy, yet still chewy. The 18-minute mark for thick-cut bacon seems to be the magic number for my oven. 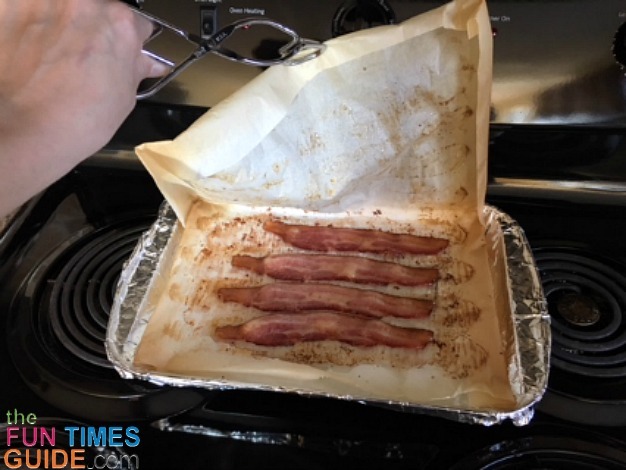 The bottom line… this is definitely the best way to cook bacon in the oven without all the mess. The rest is just fine tuning. 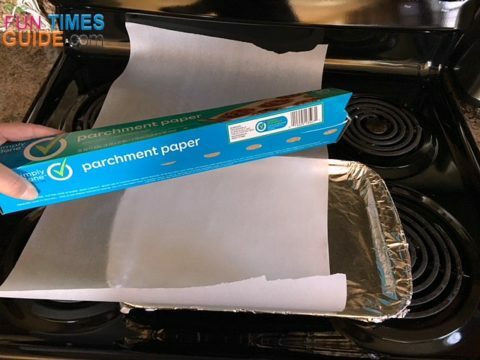 #1 – Line a rimmed baking sheet with tinfoil (for easy clean up at the end). 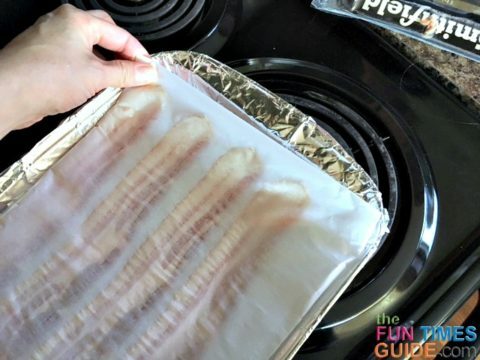 #2 – Unroll enough parchment paper to cover the base of the baking sheet, and then double it — so you have enough to cover the bacon strips as well. 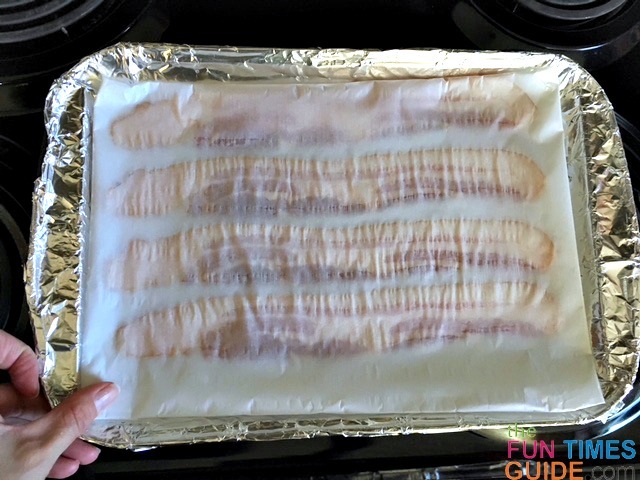 #3 – Lay the bacon out flat — individually — on the parchment paper. #5 – Place the baking sheet with bacon on it into the oven. 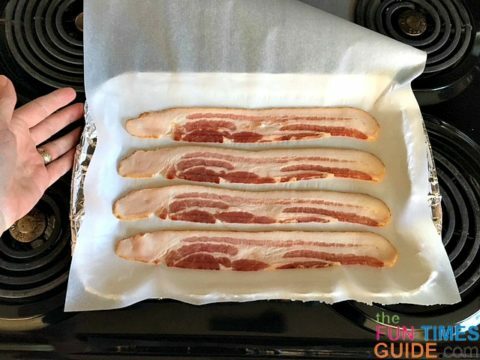 #8 – Once the timer goes off, remove baking sheet from the oven — then immediately open up the parchment paper and let it rest until the bacon stops sizzling. #9 – Get a plate or cutting board, and place a couple sheets of paper towel on it. 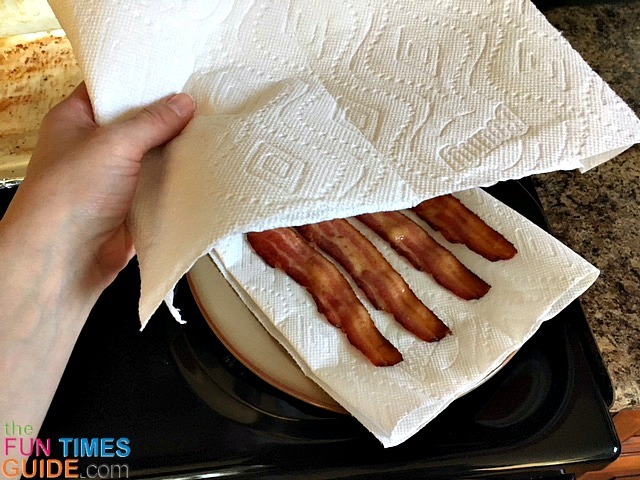 Use a spatula or tongs to lift and place the bacon onto the paper towel. #10 – Place a few sheets of paper towel on top of the bacon, and press down — to absorb excess grease. #11 – Serve the bacon immediately, or store for later use. The clean-up is the best part about cooking bacon in the oven this way! Once the bacon grease cools, gather up the used parchment paper and tin foil. Then toss it into the garbage. You don’t have to pre-heat the oven — just turn the oven on as soon as you load the rimmed baking sheet. The oven bakes the bacon perfectly flat and evenly every time. Once you know how long to bake bacon in your particular oven, there is no need to turn the bacon over or check on it. It cooks itself — so you can focus on other things within that timeframe. No more grease splatter inside your oven! Plus, you won’t have to worry about hot grease splattering on your skin, your clothes, or your stovetop. You can free up the space on your stovetop to cook other foods. The clean-up is easy — just toss out the parchment paper and tinfoil. There are no wire racks or pans to clean or scrub. I hope you enjoyed this tutorial showing how to cook bacon in the oven without the mess. If you have a favorite method for cooking bacon, please share in the comments below!